A one-bowl recipe so simple it will fast become a Thanksgiving staple. 2. Spray 9” pan with non-stick spray, line the bottom with a circle of parchment paper, and set pan aside. 3. In a large bowl, whisk together flour, cinnamon, ginger, salt and baking soda. 4. Add eggs, sugar, buttermilk or yoghurt, applesauce and oil and whisk gently until combined. 5. Using a rubber spatula scrape batter into the prepared pan and smooth the surface so it is even. 6. Bake until it is barely firm and a cake tester inserted comes out clean, about 55 minutes. 7. Set cake aside on a wire cooling rack and let cool to room temperature. 8. Remove from pan and parchment paper. 9. Place on cake plate and set aside. 10. To make frosting: in a large bowl combine cream cheese, sour cream, honey and salt and whisk aggressively until cream cheese is slightly aerated. Use a handheld mixer or stand mixer if desired. 11. Spread frosting over top of cake and serve. •	Can be refrigerated for up to 3 days. I was pleasantly surprised with this simple recipe. It smells and tastes like autumn and is the perfect dessert for Thanksgiving. 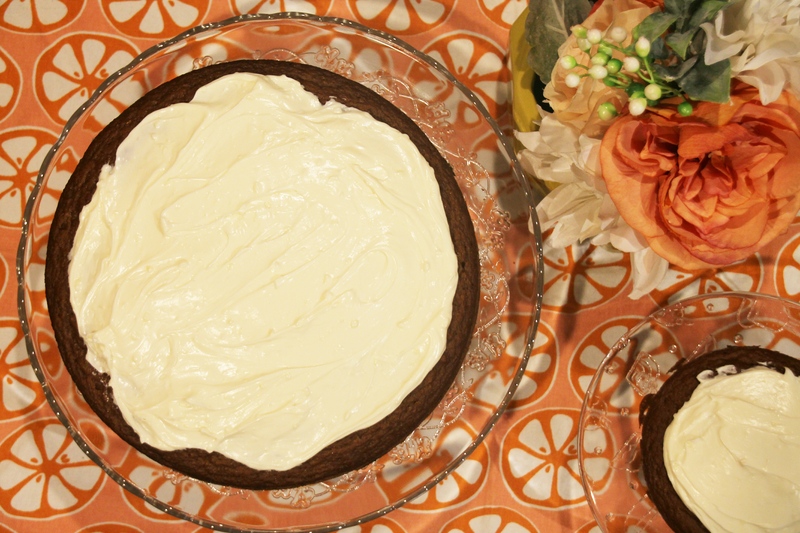 The mix of the seasonal flavours and the addition of the applesauce kept ths cake moist. The icing didn’t turn out as I expected even though I followed the recipe, or this is a looser icing. I added some buttercream frosting to the mix to firm it up. This cake will not travel will with the icing as is. I recommend if you are bring the cake somewhere, make the frosting, put it in a container, and dress when you arrive at your location. Otherwise, I will be making this again and just altering the frosting for myself personally.